Maggie is left bankrupt after her divorce from Freddy Gold, a Las Vegas casino owner. After her ex-husband death in mysterious circumstances, she decides to explore the casino for clues about his death and details about the inheritance. 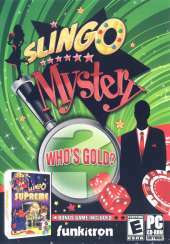 This is an adventure and hidden object spin-off from the Slingo series of slot machine games. The main objective of each scene is to find and collect all the objects listed at the bottom of the screen, with some of the items stored in the inventory to be used later when solving puzzles. Some of the objects drop coins and jewels that can be collected for extra cash. The bottom interface has portraits of Maggie and her friend over the phone, where clues appear as speech or thought bubbles floating over their heads. The hint button is a lamp that glows when ready, showing the position of one of the required objects when clicked but taking some time to recharge after use. The puzzles can be solved in the standard way for point-and-click games, by dragging and dropping items from the inventory to a logical place on the scenery. For example, a key can be used on a door to unlock it. At some points in the game, the main character must complete a Slingo challenge to receive a key item. The Slingo machines have full implementations of the game, where the player must complete a whole grid of numbers by spinning slots and matching random digits in a gameplay combination of slot machines and bingo mechanics. Like in the previous titles, some of the slots and grid cells have power-ups that are stored at the right side after being collected. They give extra spins, reveal hidden power-ups in the grid and help the player in several other ways.